(From left) César Hernández, William Mendez, Larry Parr and Yadira Quilzapa wait outside the community library in Las Delicias. Halfway up the back slope of San Salvador Volcano, César Hernández wakes up at 4 a.m. and leaves his family’s home on a coffee plantation at 5. He makes the hour-long walk down the mountain to the community of Las Delicias, where he catches the bus for another hour’s ride to San Salvador. On the way through his town, he must be careful whom he talks to. Not only are gang members watching everything and everyone, the police or military frequently come up the dirt roads “looking for gang members.” To them every young man from the community is a suspected gang member who needs to be intimidated, roughed up or worse. Violence, including murder, is common in communities like Las Delicias. While murders have decreased since 2015-2016, when El Salvador had the world’s highest murder rate, disappearances have increased and the rate remains among the worst in the world. Larry Parr walks with college scholarship students César Hernández, Yadira Quilzapa and William Méndez in Las Delicias, El Salvador. San Salvador Volcano is in the background. Hernández makes this long commute to reach the Jesuit-run University of Central America El Salvador, where he studies mechanical engineering. That Hernández, whose family has very limited economic means, is able to have this opportunity is due in no small part to the support and mentoring he has received through a youth program developed by Maryknoll lay missioner Larry Parr. Sometimes, when it is too dangerous for Hernández to make the long trip back to his house on the other side of the volcano, he even stays overnight at Parr’s family’s house close to the university. Parr has been working in Las Delicias for the past 11 years. Together with community members and with the support of Maryknoll Lay Missioners and a local community foundation, he has created a variety of programs designed to provide safe spaces and alternatives for young people so they can become educated, stay out of gangs and develop into leaders and role models for their community. A truck rumbles down a dirt road in Las Delicias. Only about 40 percent of Salvadorans graduate from high school and fewer than 10 percent from college. Even though public education is free, many families cannot afford to pay for books and supplies or the 40-minute bus ride to the nearest high school. Schools in poor communities have few resources, so the education that young people receive there is far inferior to that in wealthier areas. To help improve educational opportunities for the young people in Las Delicias, Parr’s youth program provides tutoring and mentoring as well as scholarships both for high school and for university students. Just as important are community projects such as the community library, which hosts many activities, including sports, arts and community improvement programs. The most popular is a soccer program that is celebrating its 10th anniversary in May. Called Playing for Peace, it provides a safe place for young people from ages 6 to 21 to play soccer and participate in tournaments. Run by young people from the community who serve as role models and mentors, it is more than a soccer program. César Hernández shows off his breakdance skills. His favorite is the breakdance program, through which he passes on his own passion for breakdance to younger kids who just as eagerly embrace it. On their way home from school, grade schoolers catch up with Larry Parr. 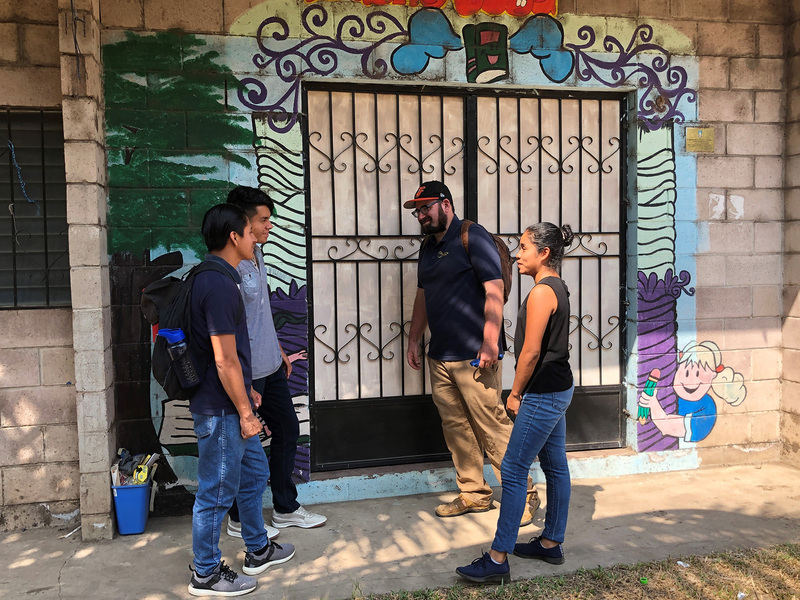 On a recent morning, as Parr, Hernández and two other scholarship recipients walk through Las Delicias, it is evident that many good seeds have been planted in this community. Along the way, grade schoolers warmly greet Parr and the college students, sharing their news, discussing progress at school and anticipating their next activities in the program. 1 Response to "A play for peace"
Congratulations to Larry and all the Maryknollers still in El Salvador. I worked in Ciudad Barrios in 1979-1980 as a seminarian and still give church talks for the Lay Missioners. I hope to take Larry’s story to parishes in Cincinnati and Albany this Summer.